Main Home Page for Issues of Homelessness project by teachers and students. 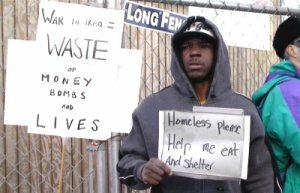 This page has links to web sites related to homelessness. This page has information and links to articles on tactics used against homelessness used during the Depression Era. This page has links to pictures from a party for homeless children held in Boston, Massachusetts. It shows pictures from the setup day and the preparation. This page describes the technology used for the Issues of Homelessness project. One of the goals of this project is for students and teachers to become open-minded and non-judgmental when exploring the issues related to homelessness. Cooperative learning strategies and problem solving skills will be strengthened. Visual art, poetry, film making and photography will be the means of expression, reflection and assessment.